After the reported deaths of the final two Shaker sisters, only one bona fide Shaker exists—Brother Arnold Hadd of the Sabbathday Lake community, New Gloucester, ME. 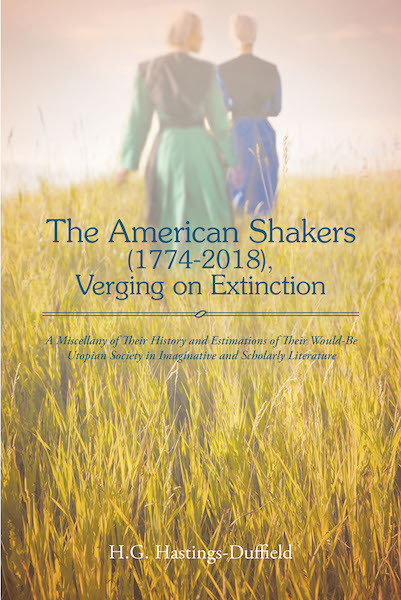 My thesis is a documentation of how Shakers have been perceived and delineated in the imaginative literature (fiction) by non-Shaker authors of “the world,” to use the Shaker patois, from CE 1829–2018. I fancy my book to be a tribute to the Shaker Society since I lay blame on such writers for their failure to tell the truth (facts) about the most successful utopian society in American history. Commonly, the writers are bigots and denigrate the Society because its principles and practices differ from that of the authors.